FalconStor Software empowers IT professionals to achieve mastery of their data - an organization's most precious asset. 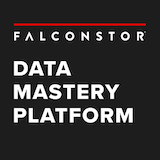 Our flagship solution, FalconStor Data Mastery Platform, is a modern, comprehensive and easy-to-use software platform that gives IT professionals centralized data management control across all their resources to reduce costs, lower risk, and avoid compromises. FalconStor's vendor and hardware-agnostic solutions are designed to work with existing investments across complex environments, including legacy data centers, hyper-converged infrastructure, cloud, and hybrids.